This article is a demonstration of the seething hate the neocon media have, coupled with the assistance of compromised government organs, towards those who propound Islam. This is an exposition of an example of where impartiality has been forfeited in order to support and propagate the neocon narrative against Islam and Muslims. Referencing a network of anti-Muslim extremists, the Telegraph (or rather, theTorygraph) has done a spread on iERA, wrapping highly specious anti-Muslim rhetoric as a “report”, and in the process, smearing a Muslim organisation. It is necessary to note that iERA has been subject to an investigation into their governance, not extremist views. The Council of Ex-Muslims of Britain (CEMB) was launched in 2007. It is a front organisation for the anti-Islam, far-left Worker Communist Party of Iran and consists mainly of the party’s members. CEMB’s primary public advocate is Maryam Namazie, who is also the editor of the report which the Torygraph has cited,Evangelising Hate. Ignoring the self-evident hypocrisy of using an “ex-Muslim’s” report, her vitriolic hate for all religions and in particular Islam makes her one dubious character to reference in an article about Islam and Muslims. Nevertheless, I will let her own hate-speech exemplify my point. She has supported the highly “illiberal” ban on the hijab and purports to justify it with a twisted logic of choice. Not one for impartiality then. Conversely, she is lauded by the far-right, terrorist-inspiring Robert Spencer crowd! Her “report” reinforces the insidious neocon narrative on Islam and Muslims. 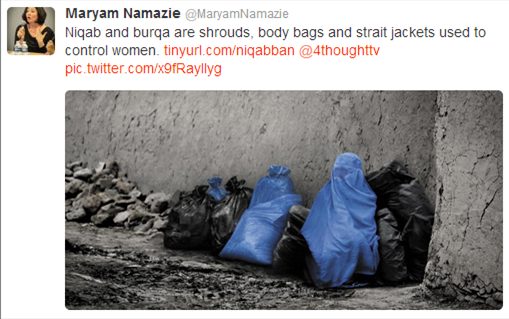 And it seem that the neocons are indeed using her to further their vision of Islam and Muslims. The neocon-controlled Department for Education consulted Namazie regarding the fabricated “Trojan Horse” plot and “Islamism”. And now the neocon peddling Torygraph has put together a hatchet-job which makes the Iraq dossier look like a peer-reviewed journal, using the hate-filled Namazie. Ironically, Namazie once spoke out against Ayan Hirsi-Ali for “mixing with the neo-cons”. It seems Namazie herself being abused by the neocons no longer bothers her. The repugnant reliance on the extremist variety does not end there for theTorygraph. The report makes several references to a website which is run by Harry Matz who is a member of the violent extremist group EDL and the Jewish Defence League. The main target of the smear is Abdur Raheem Green, accusing him of anti-Semitism and homophobia. What the report fails to mention is that firstly, Green has issued a clarification of the statements made and selectively referenced in the “report” and has apologised to all those who may have been offended by his past speeches. Secondly, the comments were mentioned a long time ago, a period over which the views and articulation of those views change. The accusations thus demonstrates a seething hate and obsession to demonise Muslims at the expense of genuine impartiality. Before the neocons reject this notion (because Green is Muslim, presumably), they would do well to examine Roger Scruton, the ideological inspiration of Charles Moore, the former editor of the Telegraph and Douglas Murray who frequently cites Scruton in his anti-Muslim book Neoconservatism: Why We Need It. In his essay, “Sexual morality and the liberal consensus” (1989), Scruton called homosexuality a “perversion” and argued homophobia could be justified before modifying his view in 2010. As for Dr Zakir Naik, it gets interesting because Naik was the preferred choice to “prevent extremism” of the then counter-terrorism head, Charles Farr, who supported Naik’s entry and believed he could be used to counter extremism. The Conservatives (obviously) supported May’s decision, however Farr clearly statedthat May’s “decision was wrong”. The Torygraph, in an effort to expose the hate of an organisation dedicated to spreading the message of Islam, has in fact demonstrated its own bigoted hate of Islam. It has sought to reference anti-Muslim extremists; Maryam Namazie who has been praised by terrorist-inspiring Robert Spencer, and a Spencer-ideology-sharing EDL member in what can only be ironically described as “evangelising hate”. In other words, this is anti-Muslim propaganda. The question is, what will the government do to deal with this?